Dr. Mildred Watson: You're just like Don Quixote. You think that everything is always something else. Justin Playfair: Well, he had a point. 'Course he carried it a bit too far. He thought that every windmill was a giant. That's insane. But, thinking that they might be, well... All the best minds used to think the world was flat. But what if it isn't? It might be round. And bread mold might be medicine. If we never looked at things and thought of what might be, why we'd all still be out there in the tall grass with the apes. 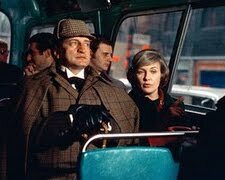 Justin Playfair (George C. Scott), a former judge, thinks he is Sherlock Holmes and his psychiatrist Dr. Mildred Watson is fascinated by his case. Joining the story of Don Quixote on to Sherlock Holmes story. Playfair is quite convincing as Holmes, but his brother can't wait to commit him but he needs Dr. Watson's signature. Playfair helps the underdogs and fights against the corrupt institutions, all with his pipe in his mouth. Playfair can identify with other psychotics and can think like they can. A man who won't talk is analyzed by Holmes/Palyfair as Rudolph Valentino, the silent film star. Once introduced, Valentino begins talking. Justin Playfair was a 'great reformer, always out to make things better", but when his wife died he became Sherlock Holmes. Holmes is trying to find Moriarty, who he blames for everything evil in the world. When Holmes analyzes Watson, she is stunned by his genius and disturbed by his insights. When Mildred introduces herself as Dr. Watson, he is the one fascinated. She is now part of the team. Holmes and Watson set off on a series of adventures as Holmes searches for Moriarty. Dr. Watson is trying to save Playfair, from his brother who wants him committed so he can get his money. The movie then takes a turn towards romance between its two leads. A really good movie with two great actors buying in to their roles. The interaction between the two is just great to watch. The movie does slow down in the last third, but still well worth seeing.